Large numbers of files and folders with 1 click, filter on mp4 or other file types. Look for a video converter which encodes using all CPU cores simultaneously? get the job done in double quick time. 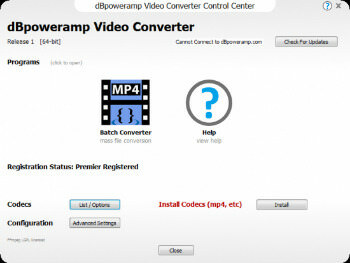 Process video and audio with effects, such as scale, or denoiser dBpoweramp is a fully featured video converter. Free converters come with a little extra (a spying toolbar, Trojan, malware, or virus), dBpoweramp has never bundled in 15 years, those wanting just a video converter, get just that and only that. No Trojan, no malware, no viruses. dBpoweramp integrates into Windows Explorer, that is as simple as right clicking on the video file >> Convert To. Popup info tips are all provided giving details of the internals of your videos.